Eric Miller focus their research investigations within the area of transportation modelling and simulation. Professor Eric Miller is a well-known and highly regarded pioneer in the development and application of agent-based microsimulation model systems in high-performance computing environments. 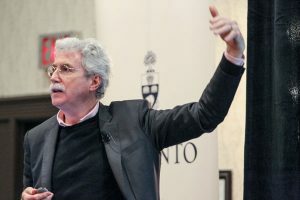 As director of the University of Toronto Transportation Research Institute (UTTRI), his research is centered in the implementation of activity-based travel models for use in operational practice. This includes the development of integrated transportation-land use models that permit the analysis of the two-way interaction between transportation systems and urban form. His work serves to improve urban transportation best practices and policy decision-making and, thereby improves the quality of life in urban settings. Professor Miller has also played a key role in establishing the Data Management Group (DMG), which provides data to government agencies, private sector partners working for government, and university researchers in support of a wide variety of travel behaviour analyses and modelling activities. He was also instrumental in the creation of the Travel Modelling Group (TMG), a research consortium that seeks to provide a forum and mechanism for inter-agency collaboration that will lead to improved travel modelling practice for all. Current GTHA transportation agency partners in TMG include Metrolinx, the Ontario Ministry of Transportation, the Cities of Toronto, Hamilton, Mississauga and the Regions of Durham, York, Peel and Halton. Professor Miller currently serves as TMG’s Research Director. My main area of research is the development of a comprehensive, integrated, microsimulation-based software environment for modelling urban transportation and land-use systems. Development of the Integrated Land Use, Transportation, Environment (ILUTE) modelling system is a multi-year, multi-university undertaking, involving researchers from Calgary, Laval and McMaster Universities, led by our research team at the University of Toronto. Microsimulation involves the modelling of the behaviour of individual "actors" within the urban system (persons, households, firms, vehicles, etc.). Overall system behaviour (population and employment distributions, transportation flows by mode, etc.) is then the sum of the behaviours of all the individuals within the system. While computationally intensive, microsimulation holds the promise of providing more accurate, more policy sensitive estimates of travel demand than current conventional modelling techniques. Development of the ILUTE modelling system involves state-of-the-art object-oriented programming methods, development and implementation of a wide variety of behavioural sub-models, use of a variety of novel data collection procedures to obtain the dynamic, micro-level behavioural data required to develop these sub-models, and a wide variety of other individual research projects suitable for student involvement at the bachelor's, master's and Ph.D. levels. In parallel with my more formal modelling efforts, I also am involved in the empirical analysis of the relationship between urban form, transportation system configuration and the energy efficiency/environmental sustainability of urban transportation systems. This work involves the statistical analysis of both observed and modelled travel behaviour, as well as the use of Geographic Information Systems (GIS) for the analysis and display of spatial data. Over the past number of years I have developed GTAMODEL, a multimodal, regional transportation modelling system for the Greater Toronto Area (GTA). This four-stage modelling system is used by the Ontario Ministry of Transportation and other GTA planning agencies to analyze and forecast travel demands in the GTA. On-going evolutionary development of this EMME/2-based modelling system provides the opportunity for student research topics in a variety of areas including trip generation, distribution and mode choice modelling, for both work and non-work purposes. Cities are â€œproblems in organized complexityâ€ (Jacobs, 1961). This course will explore this theme and its implications for city engineering and management in terms of: introduction to complex systems theory; exploration of cities as systems (physical, economic, social, etc. ); holistic and reductionist approaches to 'a science of cities'; approaches to city planning and design in the face of complexity; challenges to sustainable design; and decision-making under uncertainty. Registration in this course is reserved for MEngCEM students. Other students wishing to register must request permission from the Office of Student Services. The land use - transportation interaction is the focus of this course. Basic concepts underlying urban spatial processes are introduced. Land use forecasting models used to project future land use (principally population and employment distributions) for input into transportation planning studies are presented. Models reviewed include the Lowry Model, econometric-based models and urban simulation techniques. The remainder of the course deals with the qualitative and quantitative assessment of impacts of major transportation facilities on land use patterns. A term project dealing with the analysis of the impact of a current transportation proposal within the Greater Toronto Area on adjacent land use constitutes an important component of the course work.